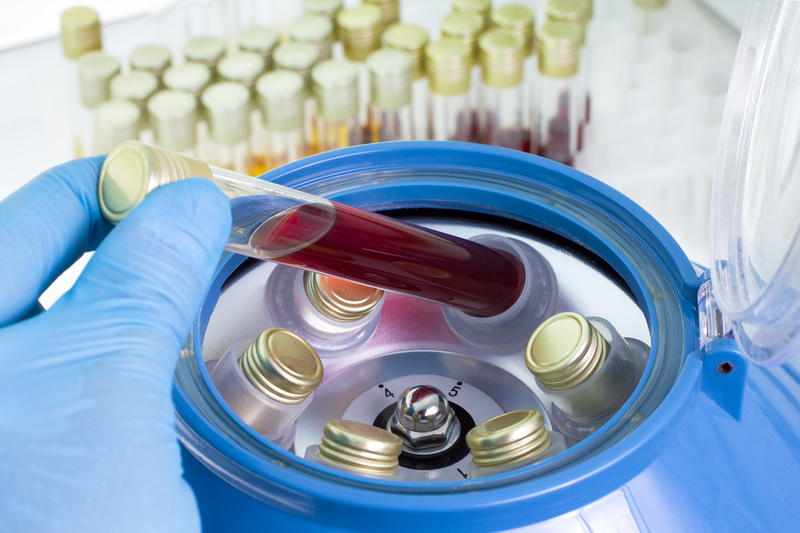 Centrifuges are one of the most popular pieces of equipment in both labs and homes across the world. Originally created by an engineer named Benjamin Robins, it wasn’t until 1869 that a centrifuge was used for laboratory purposes. Working under the sedimentation principle, the centrifuge has become one of the most useful tool to chemist, biologist, and biochemist alike. To help ensure an increase in productivity during centrifugation, many different models have been created. Below is a list of the different types of benchtop centrifuges along with their individual benefits. The classic centrifuge found in labs today is the benchtop centrifuges such as the Eppendorf 5424. Reaching speeds of 15,000 rpm and a max g-force of 21,130 rcf, the centrifuge is perfect for the separation of organelles and other samples. Due to its size and capacity to hold 24 centrifuge tubes at a time, the Benchtop centrifuge is great for labs that are constantly using procedures that rely on centrifugation. While the classic benchtop centrifuge suites most researchers needs, others find the size of the machine to cumbersome to be useful. This is where a mini centrifuge, like Benchmark’s MyFuge Mini, has helped labs across the country. With the dimensions of 4.5×5.9×4.5in a mini centrifuge will optimize a researcher’s productivity, while taking up less benchtop space. When comparing the benchtop centrifuge and its mini counterpart it is important to note that the mini centrifuge has the capacity of 8 centrifuge tubes and will reach speeds of 6000rpm. So while it has the ability to increase general productivity, it may not suite high output labs. When deciding on the right centrifuge for your lab, not only the size of the centrifuge but the size of the samples should be considered. Working with a sample size of 100uL in a 2mL centrifuge tube is impractical and increases the risk of solution lost or contamination. The micro-centrifuge was designed to specifically to resolve this problem. The CAPP Rondo Centrifuge, for example, has a carrying capacity of 8 0.2mL or 0.5mL micro tubes. While providing a reliable speed of 6000rpms, this centrifuge is great for researchers that make their own PCR master mixers and many other procedures. If your lab constantly does PCR than the Plate-Centrifuge, may be the best thing to happen to your lab. Designed to hold two of all the popular types of PCR plates, these centrifuges “ensures all reactants are in the bottom of the wells for proper concentrations and correct results.” One of the best plate-centrifuges on the market is Benchmark’s Plate Fuge Microcentrifuge. Half the size of a benchtop centrifuge, the Plate Fuge, allows for an horizontal spin with a speed of over 400xg. With its “unique wing-out rotor design”, spillage will be prevented and you will be able to increase your data output. When dealing with temperature sensitive samples, even the slightest change in temperature can cause your experiment to be ruined. This is where refrigerated centrifuges help researchers confidently process there samples without fear. 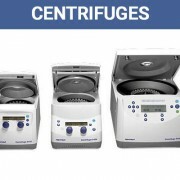 Most refrigerated centrifuges are fairly similar to their benchtop counterpart. For example the Eppendorf 5424R centrifuge has all of the same specifications as the Eppendorf 5424 centrifuge. To help ensure optimization the Eppendorf 5425R has a temperature control range of -10° to 40°C. Now that you have determined which centrifuge will increase the productivity in your lab, it’s time to start looking at the price tags. At Pipette.com we offer the wonderful prices on the highest quality products. Currently our Eppendorf 5424 Centrifuge is bundled with a Free 3-Pack pipettes with purchase. 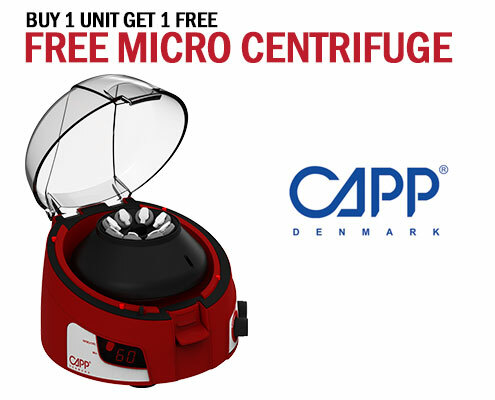 If the micro-centrifuge has caught your eye and then you will love our CAPP Rondo promotion – Buy one, Get one Free! 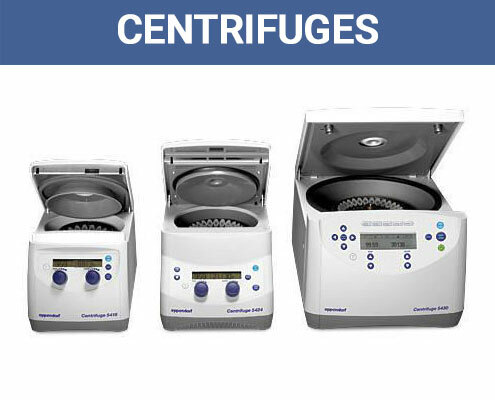 To check out these and all of our other great deals on reliable centrifuges click here. If you have any questions about our amazing promotions or the many products we have Pipette.com, please contact us by phone or email.